WaterPura Chemical Free Baby Wipes are a new advancement in the care of your little ones. Normally when you buy wipes they are laden with chemicals that are bad for your baby's skin (or your skin if you are going to use them on yourself). The chemicals are not good for the sensitive skin of a baby, whose skin is too sensitive to handle anything more than water and possibly a couple of other ingredients. Diaper rash often forms and we don't know if it is from the wipes we use or if it is due to something else altogether. The founder of WaterPura Chemical Free Baby Wipes, Emily Frazer, had a baby who was born with bright red hair and pale sensitive skin. He would often get diaper rashes and she realized that the wipes were part of the problem. So she sought out a better solution. Immediately she switched to soft cloths and water and his diaper rash got better. She was right, it was the wipes. She asked herself, "Why can't there be a baby wipe with just water and no chemicals?" The story of WaterPura began. 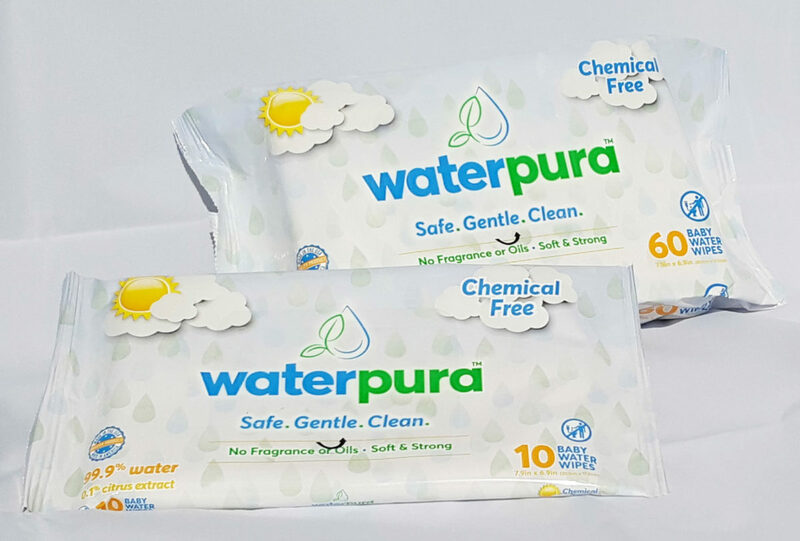 WaterPura Chemical Free Baby Wipes Contain 99.9% water and 0.1% citrus extract. They are fresh and natural wipes that are made without any chemicals yet they work just as well as regular baby wipes. These wipes are American made, all natural, chemical-free, soft and strong, and they do not contain any fragrance or oils. These are the perfect choice for parents with children who have sensitive skin. Because of the frequency of which parents use baby wipes, coupled with the fact that they are used on the most delicate areas and that the area is not washed off after use, makes WaterPura the ideal choice for a baby wipe. Their natural composition and durability makes them the ideal natural baby wipe for everyday use while eliminating the risk of an allergic reaction from the harshest chemicals found in regular baby wipes. You will find that clean, fresh skin is just a gentle wipe away with WaterPura's all natural fragrance-free and hypoallergenic formula. Currently I do not have a baby in the house, but I still find things to use baby wipes for. I used the WaterPura baby wipes and found them to be just as good as regular baby wipes. The only difference is these do not have any chemicals or fragrance in them, which is great, because I don't like the artificial chemical fragrance in other baby wipes. I received two packs of 10 to try out. Those are the smaller packs that they have for samples. I used them all up I was so happy with them. They clean just as well as other baby wipes, without having to use more than the usual amount of wipes. I find that these wipes are just as good as regular chemical laden baby wipes. 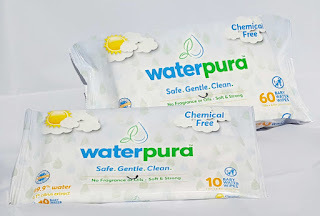 WaterPura Chemical Free Baby Wipes are available online at www.waterpuracare.com. Like WaterPura on Facebook: https://www.facebook.com/WaterPuraCare/; Follow WaterPura on Twitter:@WaterPuraCare and Follow WaterPura on Instagram:https://www.instagram.com/waterpura/.